A 14-year sequel, what took so long? 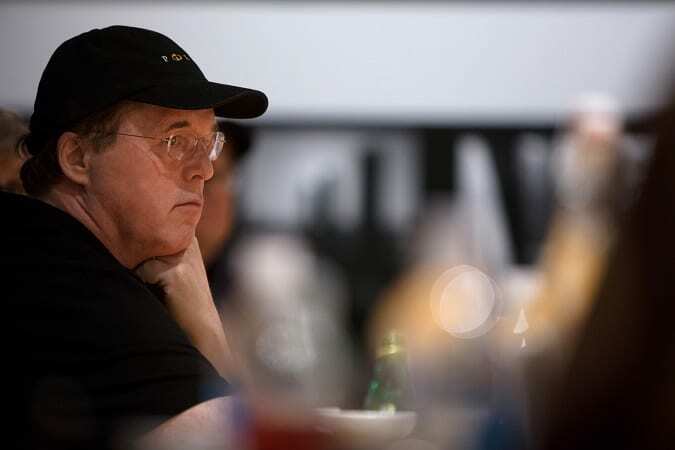 We seem to live in a world now where we just demand a movie sequel, or what Brad Bird described in our Incredibles 2 Interview as going from the “soda pop” to “direct syrup.” While he certainly admits that the idea for a sequel came as early as 2003, there wasn’t a rush. I just don’t think it’s the greatest idea creatively to follow-up a successful film with it’s sequel. I think that you wanna take time. You wanna think about it. You wanna enjoy the process. For me, I was always thinking about it in the back of my mind, but I had other things that were more at the forefront. And the more I chewed on it, the more I thought, “yeah, that’ll be cool.” Then suddenly it was like 15 years later and I went, “holy crap, I better get going on something.” It’s not intentional, and it’s not calculated in any way. It probably would’ve been smarter if it were a cash grab to do it a lot sooner. But, I just was mulling on it and it finally seemed like the right thing to do. I didn’t wanna wait any longer though, because it was clearly too long. Maybe a deeper reason why there was such a lull between The Incredibles and Incredibles 2 is it’s personal. 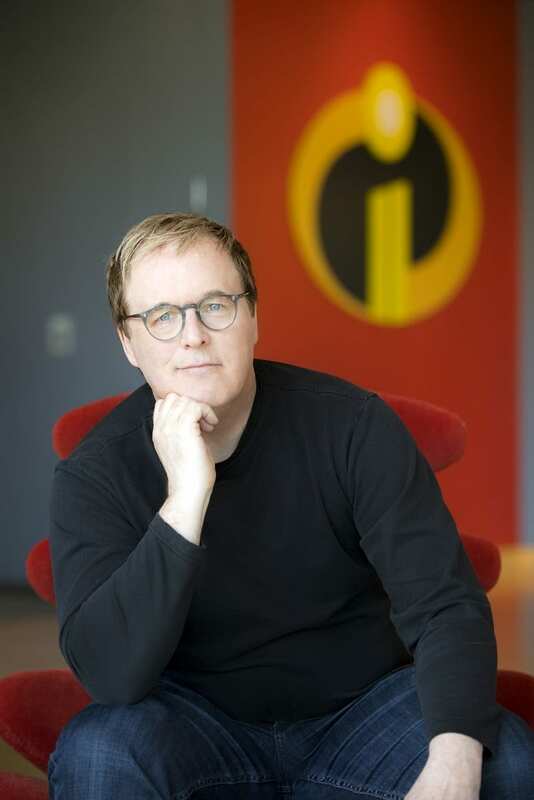 Brad Bird confessed during our Incredibles 2 Interview that even the brightly colored pop confection can’t hide his deeper connection to the film. Outwardly it’s a really commercial movie, but it’s actually strangely personal to me. It has a lot of the things that I loved at the age of ten, combined with the family that I grew up with and the family that I have with my wife and sons. Even though it seems brightly colored and pop confection, it’s actually really personal to me. That Incredibles 2 story line? In one word, painful. What’s fun after you’ve made the first [movie] is that you have your ideal voice cast. When you write, you’re actually imagining Craig T. Nelson, Holly Hunter, Sam Jackson, Sarah Vowell’s voices. So it’s even easier to write, in terms of dialogue. In terms of story, it’s not easy at all. It’s really hard. The character part is fun. The plot part is painful. The central idea, which was a role switch between Bob and Helen, and the fact that the family didn’t know of the baby’s powers and that they would learn about it in this film, that almost dates back to the first film’s release. I had those ideas. What changed all the time was the superhero plot. That changed radically. Because we had less time to do our film, if something didn’t pay off immediately, you had to abandon it. The release date was looming and you had to find stuff that, “oh, this works. Go! This doesn’t work. Kill!” It was this sort of binary process. So, that was tough. But the core idea of Helen getting the mission and Bob staying at home and them having to cope with the baby’s powers, that’s my oldest idea for this film. 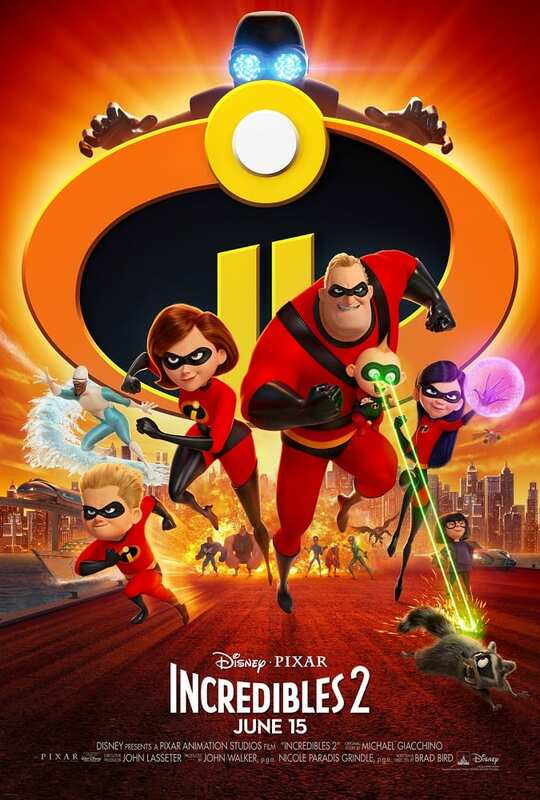 Is Incredibles 2 just trying to compete with today’s super heroes? When we did the first film, there were only two active big [super hero] franchises. So there were only a couple of films that we were competing with, I guess…? And since then it’s like every six inches there’s a superhero. If you throw a rock, you’ll hit a superhero, who will punch you in return. I think that it’s much harder to do a unique story now. Not only are there scads and scads of superhero films, but there’s television shows. And there’s television shows like Heroes where they have maybe 20 superheroes, each of whom has a story line every week. They’re chowing through potential spins on the genre at an ungodly rate. I think that if we thought about this as a superhero movie, we probably would’ve been stymied. But we didn’t. We always felt like what makes our film unique is that it’s about a family. Their superpowers were based on iconic roles of men and women and children in the family. The dad is always expected to be strong. The mom is always stretched in a million directions. Teenagers are defensive and insecure, so she has force fields and invisibility. Ten-year-olds are energy balls. And babies are unknowns. They could have no powers at all, or they could be the next leader of the free world. So where they were in the family was how we chose their powers. And that was a unique approach, because it was more about stages of your life. I think one of the reasons we’ve been successful is that everyone connects with the characters. That’s because we’ve all been teenagers. We’ve all been children. Many of us have kids. So we’ve dealt with little babies, which are really challenging to keep up with, and teenagers, which are also a handful in a completely different way. We’ve had parents that seem kinda clueless at moments and the dad that maybe speaks before he really knows what he’s talking about, the mom that manages everything. That’s where our strength lies, and that’s what makes us different. From cutting edge animation to what? In The Incredibles, the big deal was that there was no single big deal. It was everything. We had three times as many sets as any Pixar film before. We had everything that CG animation was bad at. We did humans, hair, fire, water. We had a whole film that was filled with everything that CG couldn’t do well at that point. So, it really almost broke the studio in terms of like the absolute cutting edge of what could be done — on the first film. On Incredibles 2, it still was a real challenge, but the medium has improved so much. The difference on this film from the last film is that we’re not inventing new things so much as we’re trying to stuff as much creativity into the time that we have. It’s been a huge challenge for this team to go as fast as we have. ©2003 Disney•Pixar. All Rights Reserved. One of the challenges of making a sequel 14-years later, is time. People pass away, as in the case of Bud Luckey, who voice the original Rick Dicker. And people grow older, as in the case of Spencer Fox, who voiced the original Dash. So how do you replace the irreplaceable? There were health problems with [Bud Luckey] who did the original Rick Dicker. So, he wasn’t in a position to match what he’d done before. Since then he’s no longer with us. And so, that was a challenge. We tried recording him, and it didn’t quite work yet. Then we tried to find people that sounded like that guy, and no one sounded like that guy. So, then we took the approach of saying “if that guy didn’t exist and we were casting this character from scratch, who would be the actor that we would approach?” We found Jonathan Banks. A lot of us are Breaking Bad fans and Better Call Saul fans, and he dropped in beautifully. His Rick Dicker is not exactly the same as Bud’s, but it’s every bit as cool, I think. Maybe a little tougher edged. In the case of Huck Milner, who does Dash, we always knew that in any sequel we were not gonna be able to have Dash. You just don’t retain that voice. It’s a ten-year-old voice. We always knew that we would have to recast Dash, and we got just extraordinarily lucky. Huck sounded right, but his personality was muted. And I just had a feeling that he would be right. Once he got the part, he just let it out and it happened to be totally right. He was so into it. We didn’t say what it was for, and when he found out it was Dash, he came in one day actually wearing a Dash outfit. He had a blast. I think he did a magnificent job. A surprise from Edna Mode’s return? Edna Mode’s reprised role is something that has me earnestly awaiting Incredibles 2. And to hear Brad Bird reference this Whasian bringing a surprise during our Incredibles 2 Interview? I’m all for it. It’s strange that a half-German half-Japanese bossy midget is something that feels very natural to me. But I think that at my most confident moments, I’m sort of like E. She exists in that most confident moment all the time. That is something I wish that I could do. But it always cracked me up that she’s this tiny little person with no superpowers at all that can cowl superheroes, and make them feel inadequate somehow. And so, she’s a lot of fun to write. What can [the audience] expect? Hopefully some surprise, but the same character. So what’s new for the Parr family? 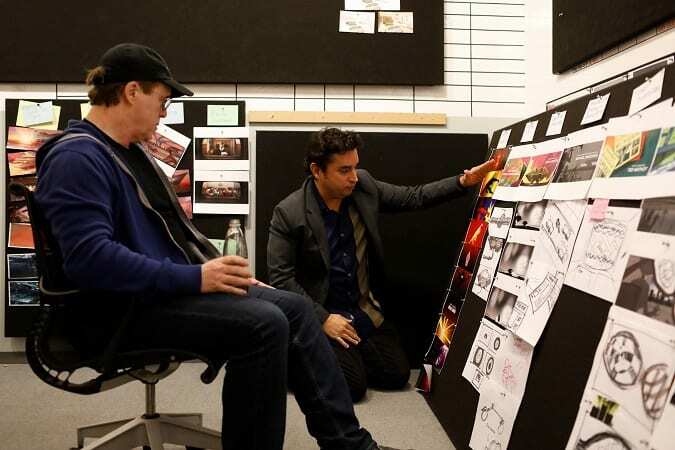 Both Brad Bird and the Producers hinted at some of the exciting moments the audience can expect from Incredibles 2. Raccoon scene, anyone? The directors and producers hinted at Jack-Jack’s evolving powers including “a baby that can go through walls and turn into a little devil or catch on fire.” Producer John Walker admits that “I love all the Jack-Jack scenes, especially the raccoon fight.” Be sure to look for that scene. 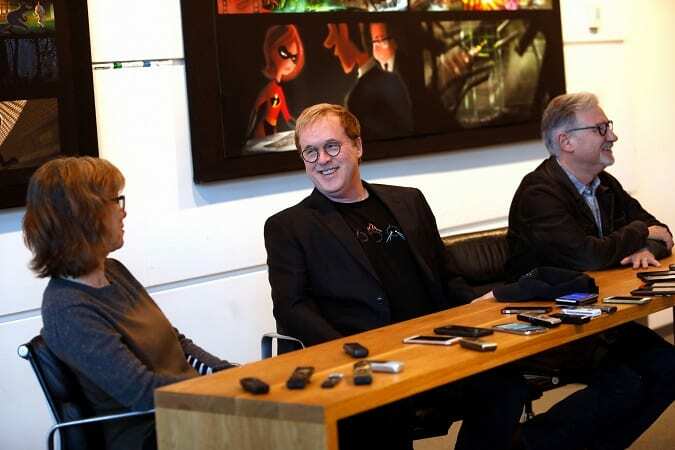 Irony is how much I saw Edna come out in our little interaction with Brad Bird. The biggest takeaway I had from this Incredibles 2 Interview is that this isn’t your ordinary Disney Pixar sequel. The 14 years of mulling and churning over this film, it’s worth the wait. I’ve only made six movies, and the most fun I’ve ever made making a movie was the first Incredibles. And so, to be able to return to this world was really fun. For me, the boldest thing a movie that’s taken 14 years to happen can do, is pick up right where the last movie left off. Who else can do that? No one. So, we did it. This Incredibles 2 interview has brought so much more appreciation to a 14-year sequel in the making. It’s more than just competing with the super hero hype or banking money. 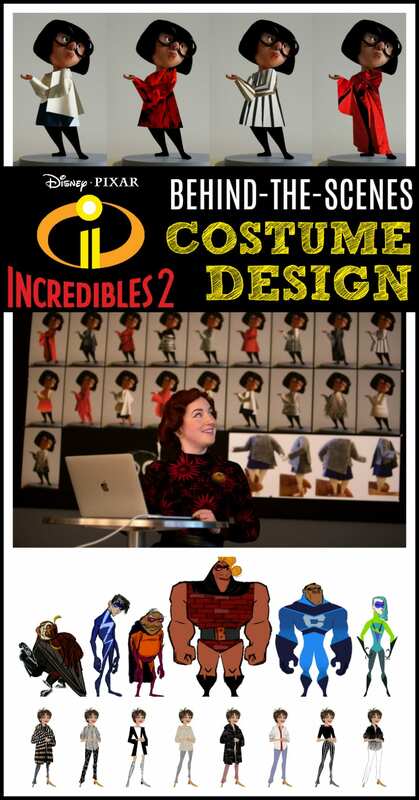 It’s about time, family and staying true to The Incredibles characters that we love. 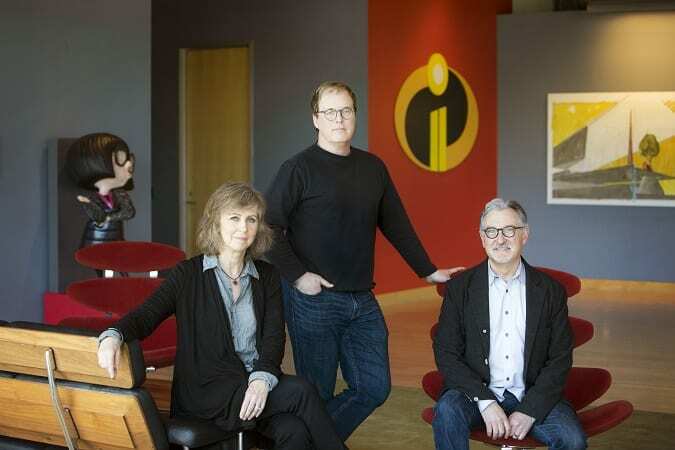 Incredibles 2 hits theaters on June 15, 2018. Who’s incredibly excited? I was invited to attend an all-inclusive press trip in exchange for this Incredibles 2 Interview. All opinions are my own. Be sure to follow Raising Whasians via Facebook, Twitter, Google, Instagram, Pinterest and YouTube for more Disney insider information, movie updates and entertainment! Thanks for this great interview. What a fun opportunity.